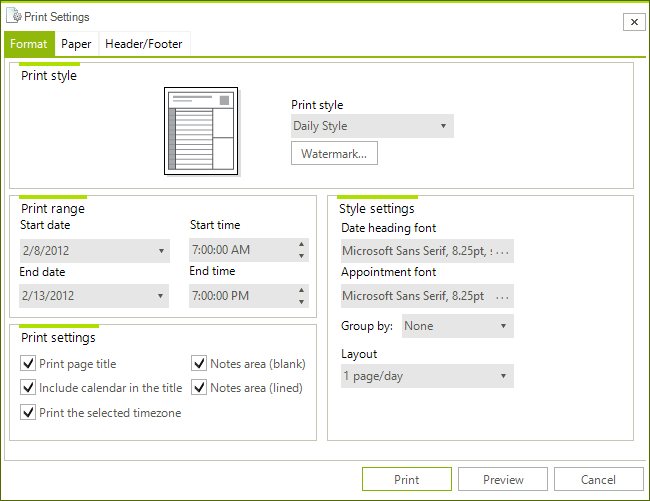 The SchedulerPrintSettingsDialog allows the end user to edit the print style settings of RadScheduler, settings of the printed paper and the header and footer of the printed document. It inherits from RadPrintSettingsDialog adding some specific to RadScheduler settings to the first tab. The other two tabs,namely Paper and Header/Footer, are described in the RadPrintSettingsDialog article. In the Print style group box there is a simplified preview of the result along witha drop down to select the current print style and a button which opens the WatermarkPreview dialog. In the Print range group box you can setup the date and time range in which appointments should be printed. In the Print settings group box you can enable or disable displaying some of the visual parts of the pages. In the last group box - Style settings - you can set settings, specific to the selected PrintStyle.